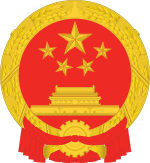 The National Development and Reform Commission of the People's Republic of China (NDRC), formerly State Planning Commission and State Development Planning Commission, is a macroeconomic management agency under the Chinese State Council, which has broad administrative and planning control over the Chinese economy. The candidate for the chairperson of the NDRC is nominated by the Premier of the People's Republic of China and approved by the National People's Congress. Since February 2017 the Commission has been headed by He Lifeng. The NDRC's functions are to study and formulate policies for economic and social development, maintain the balance of economic development, and to guide restructuring of China's economic system. The NDRC has twenty-six functional departments/bureaus/offices with an authorized staff size of 890 civil servants. NEA was established in August 2008, replacing the National Energy Bureau (NEB; 国家能源局) which attempted to reform China’s highly dispersed energy management.